Are you looking for a powerful bike that will not only let you commute around town but will also take you to the trails? A mountain electric bike is what you need. The comfort, smoothness and increased traction of a mountain bike plus a powerful electric motor to back you up and power up your rides on steep hills and rough terrain is all what you need for a fun evening of riding on bike trails. A mountain electric bike will let you experience that peaceful escape in the forest. While some may argue about the usefulness of hybrid bikes for both bike trails and street commuting, it is true that they are not as tough as mountain bikes. So if you plan to escape in the forest once in a while with a bike that doesn’t require a full gym session to ride, a mountain electric bike like the Yukon Trails Outback 26 is a recommended option. Economical, practical, and stylish, the Outback 26 is the ultimate alternative for commuting around town or for enjoying a scenic ride and experiencing great outdoor pleasure. Want to see the full feature list? If so head over to Amazon.com where they describe each feature as well. For the purposes of our review however, we detail the noticeable features of this bike in the sections that follow. The Yukon Trails boasts a lightweight yet strong aluminum mountain bike frame that is meant to provide an upright riding position and greater comfort. The 26” alloy double wall rims provide you durably built wheels that are sure to last and endure any kind of terrain. Plus, the wide 26” mountain style tires give you better traction on increased grip on bike trails. With the Shimano 7-speed drivetrain and easy gear shifters, you will stay in control and can enjoy a range of speeds, suitable for the kind of terrain you choose. 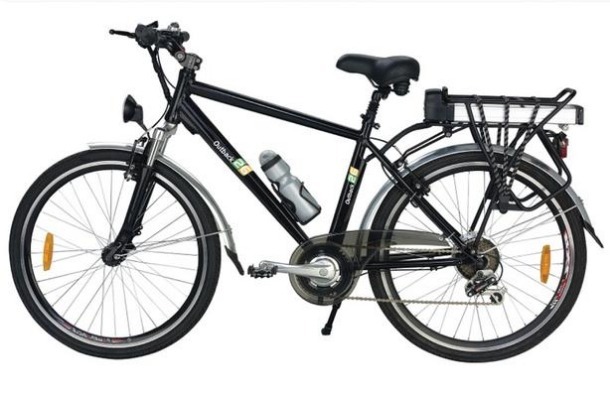 Plus, to give you an even smoother and more comfortable ride, the bike is equipped with an alloy suspension fork as well as a suspension seat post that will smooth out all vibrations along the way and make sure you enjoy a stable ride on rough bike trails as well. To keep you in control, the Outback 26 features both front and rear V-brakes to give you an implausible stopping power. The Outback 26 is powered by a 250W in-hub brushless motor that will give you a maximum speed of 15 mph with a Pedal Assisted System. The Pedal Assisted System is rarely found in electric bikes at this price range; hence, it is a great benefit. You can exert as much effort as you want while the motor will take the rest of the strain. It includes electric ignitions for easy on/off. If all your complains about electric bikes are centered around their batteries and their ranges, rest assured that you will get the best from Outback 26. 24 V 10AH lithium ion battery is lightweight and gives you a range of 30 miles per charge. The li-ion battery is easy to pull out for charging indoors. The Yukon Trails has received a rating of 3.5 out of 5 stars on Amazon with 11 customer reviews till date. Some users love it while others have been dissatisfied with its quality and performance. 1. The battery is easy to slide out, which makes it easy for charging. 2. The pedal assisted mode with a sensor detects your pedaling effort and propels motor assistance automatically. This is a good feature in a bike at this price. 3. The bike includes a cup holder and strap for holding things on the back. 4. It includes a headlight and tail light for easy riding in the dark. 5. It includes mud guards that prevent you from getting soaked up in rain. 1. A few users complained about poor customer service and broken parts on delivery. Even after inquiries, they did not get replacements. One user even returned his bike to Amazon for full refund. 2. Many users complained about the bike being hard to assemble due to problems with its parts, which all needed to be fixed. It seems like the company needs to work on its packaging, shipping, and quality control. 3. The pedals and components are not heavy duty; they can easily scratch, bend and scuff. 4. One customer also complained about the shocks not functioning well; she said she was unable to ride it on any bump without feeling the vibration. If you look at the customer reviews, this doesn’t look like a very promising bike. There have been mixed and conflicting reviews of this bike. Like, one customer has remarked about the bike being heavy while other said it is lightweight. Since its price is in the middle range at $1000 (not very cheap), you can easily add in a few hundred bucks and get a more promising bike like the Prodeco. Although its advertised as a mountain bike, its features don’t promise a good performance on bike trails. Still, if you like the looks of it, there is nothing wrong in giving it a shot as Amazon takes full responsibility and always refunds its customers. So if you don’t like it, you can always return it back.